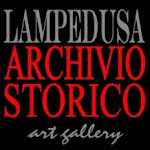 The first author to write about Lampedusa was the Pseudo-Skylax in his “The Circumnavigation of the inhabited world” a work that, according to Graham Shipley (author of a study and the English translation of the book) is not a record of an actual voyage: the work - preserved only in a single, late medieval manuscript - purports to be by Skylax, an explorer of the late 6th century BC named by Herodotos; but this cannot be true, for the text repeatedly refers to the Greek world as it was in the 4th century BC. For that reason it is known as Pseudo-Skylax. 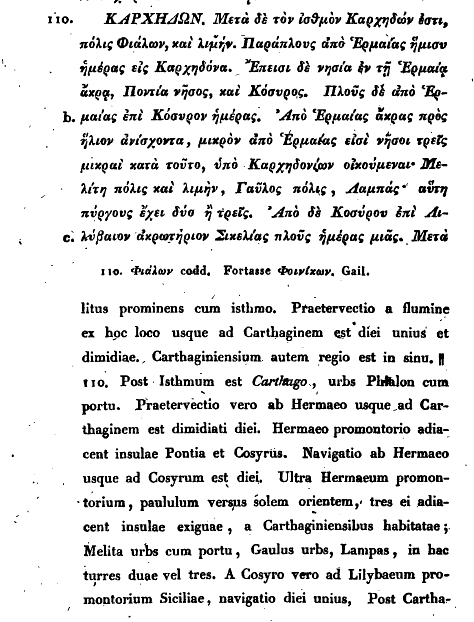 "And after the isthmus is Karchedon, a city of the Phoinikes with a harbour. Coastal voyage from Hermaia: a half of a day to Karchedon. And islets are at hand in Hermaia Cape, Pontia island and Kosyros. And the voyage from Hermaia up to Kosyros: a day. Past Hermaia Cape towards the sun rising, a small way from Hermaia, are three small islands opposite this place, inhabited by Karchedonioi: Melite, a city with a harbour; Gaulos, a city; Lampas—this one has two or three towers. 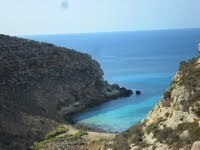 And past Kosyros up to Lilybaion, a promontory of Sikelia (Sicily): a voyage of days, one." 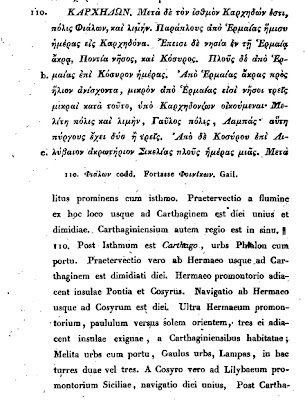 Skylax calls Lampedusa λαμπάς (a torch, a lamp, a flame) and he says that it was inhabited by Carthaginensis and that he had two/three towers. If Skylax describes the status quo of the fourth century BC we can assume that the Chartaginians had at that time already taken over Lampedusa from the Greeks and that fits well with the dates of Akragas (Agrigentum the nearest town in Sicily to reach Lampedusa by boat) which fell to the Chartaginensis in year 406 BC. 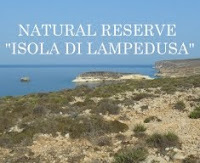 Lampedusa (Lampas) was likely a Greek colony only from circa 550BC (Akragas was founded in year 581 BC) to circa 406 BC. 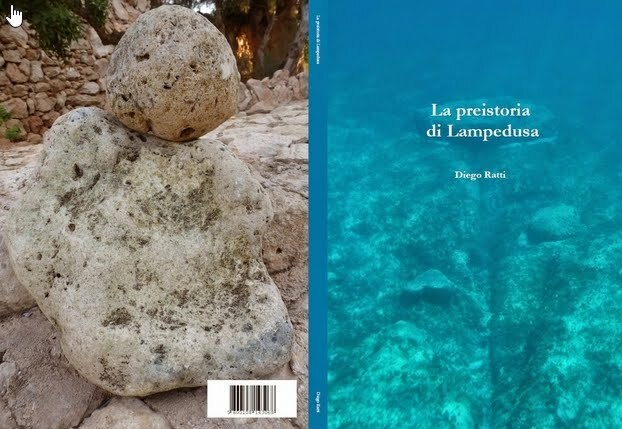 It is known that Lampedusa had its own coinage during its Greek phase.